novel in 30 days. Hundreds of thousands of people attempt the challenge every year. While not all are successful, many of them are helped and encouraged along the journey by their fellow participants. The book “50,000: Tributes to the Journey of Writing a Novel in One Month” is a collection of essays detailing the personal journeys of people who participated in the project. There are 73 short essays in the book (written in 2011), each documenting a writer’s experience with the “NaNoWriMo” project. Some have been involved for several years, others only once. 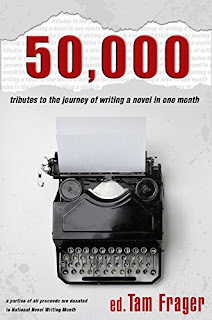 They document the discipline it takes to commit to writing 2000 words per day, and the ways that they were able to motivate themselves to complete their novels (some involved chocolate cake). Some people write of how the work of writing a novel empowered them to branch out into other creative work. Some people even found friendships and love through the supportive community of fellow writers. The essays (some no longer than a paragraph, others several pages long) are all very inspiring and come from authors in the US, Canada, Australia and Europe aged from teens through to adults who’ve been attempting to finish novels for decades. Some people write fan fiction, others chronicle painful autobiographical events. What really comes through all of the essays is the appreciation for the self-confidence and discipline that turned regular people into novelists. The sense of accomplishment and determination to continue writing is repeated in almost every essay. The only thing I didn’t like about the essays was that sometimes acronyms are used that people unfamiliar with non-NaNoWriMo don’t understand (several mention being “MLs” with no further elaboration, for instance). Also, many of the essays are directed to and express appreciation for (to the point of being somewhat overly sentimental) Chris Baty, the founder of the project who has since moved on to other things and turned it over to others to run. Since the chapters are somewhat similar in describing how people came to write and what their experiences were, it’s hard to read all in one go. It is definitely a book that would be more enjoyable to dip in and out of for inspiration, especially for budding authors. While I’ve never attempted to write a novel, reading about what a positive and supportive experience it was very inspiring!